Note: As Simon is a UK reviewer, this post deals with a UK release. US readers may be more familiar with this Tintin Vol. 1 which skips these even earlier adventures. People often ask me about the first comic I ever read. Ignoring the regular children’s comics, it would be a either one of the Asterix books or one of the Tintin books. Both are great classics, originally written in French, although Tintin was a Belgian publication. Given a choice between the two, I always pick Tintin. The stories always contained more adventure and it is set in a much more realistic world than that of the potion drinking Gaul. Also I would consider Tintin, his dog Snowy (or Milou in French) and all the other characters to be far better than any from the Asterix titles. For those who haven’t read Tintin before, here’s a bit of history. He first appeared as a comic in the children’s supplement in a Belgian newspaper in 1929. The stories were created by Hergé (Georges Remi) and his assistants. They ran until 1976. 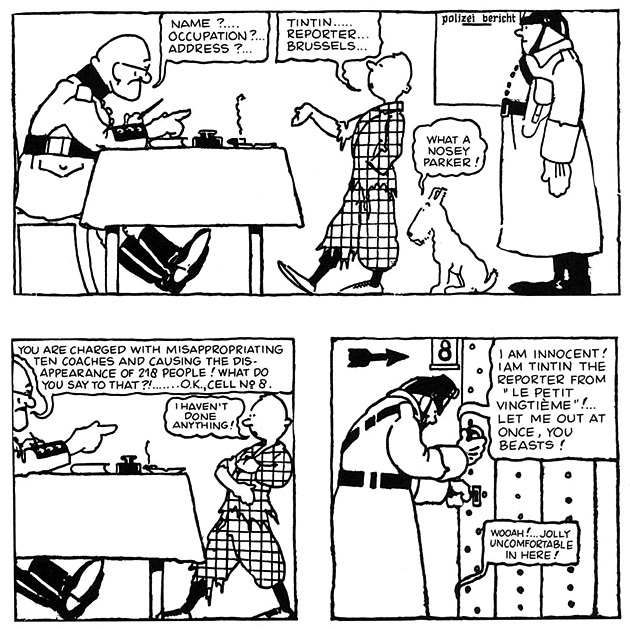 Tintin is sent on assignment to Moscow to report on the Soviet Union. It turns out that the alleged wealth of the Soviet Union is false and the Soviet secret police want to stop the report from being made by any means. Tintin finds himself in a dangerous, although often slapstick, situation of being stalked and regularly attacked by the secret police. The story acts as political satire against the Soviet Union and its propagandized well being. Hergé withdrew the publication in the mid-1930’s due to the over critical nature of the material and it wasn’t republished until 1973. This means that it was never redrawn (as Hergé redrew all his titles for re-publication in the 1940’s) so it looks fairly different than other Tintin stories. The biggest difference is that the artwork is in black and white. For me this doesn’t detract from the story at all, as this early work isn’t about detailed scenery. It was about the story and the linework works well enough to pace the us along. 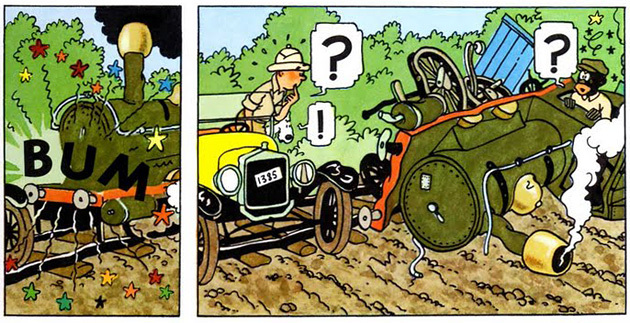 Additionally, this reproduction is historically interesting, allowing us to see a progression in Hergé’s work. There are a few surprisingly true things portrayed in the book, such as the starving of peasants as they had to export a large amount of produce to seem successful. Hergé also depicts the fixing of elections through the refusal to give food to people who wouldn’t declare themselves communists. Detractors have criticised Hergé himself for over-propagandizing, but it’s unclear how much of his story is based on research and how much is based on popular conceptions of the time. His latter stories were certainly better researched, but perhaps some slack can be cut for his early work. 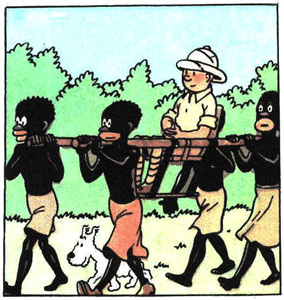 Congo sees Tintin being sent off to the colonized Belgian Congo on a hunting expedition. To make things worse the native Congo people resemble Golliwoggs and are depicted as rather primitive persons. Needless to say, this story is extremely controversial; it is why the book is wrapped in cellophane and has a content warning label on it! In one particular scene Tintin uses explosives to blow up a rhino. Another sees him kill 15 antelopes instead of just the one by accident. The story isn’t as well paced as Hergé’s latter works. On the whole, no real flow is evident and the direction is unclear. Tintin does manage to expose a smuggling ring that links back to Al Capone, which leads nicely onto the third Tintin story, Tintin in America. 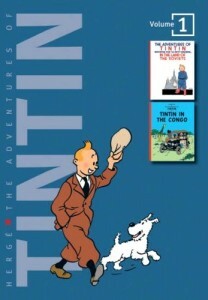 Unlike the first story in this collection, Tintin in the Congo was redrawn. It is in colour and looks far nicer than the first story. One interesting fact about this story is that the regular characters the Thompsons weren’t included originally and were drawn in when it was republished. 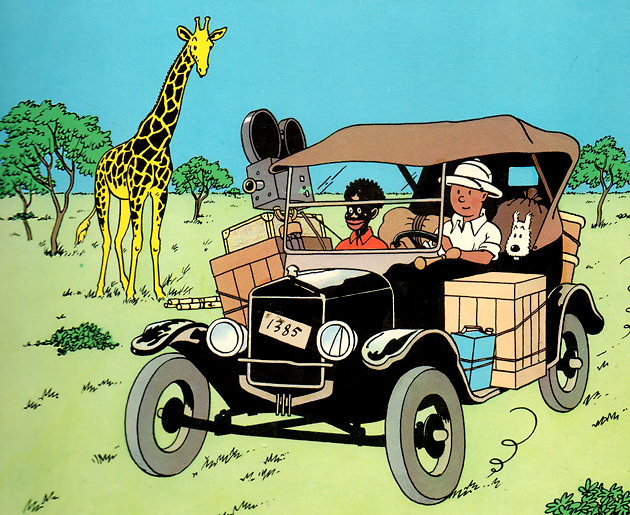 Unfortunately, Hergé kept the naive 1930’s racism in the story. It is a real shame, as it was largely due to his employer on the strip who felt the “values” of colonialism should be taught to the Belgian youth. While this is of interest to those of us who value comic history, it makes this book quite a bit less kid-friendly compared to other Tintin titles. Other than the overt racism shown in the second story, there is one more thing that lets down this collection: the translation. Obviously, both stories were originally written in French. Due to their more controversial nature they had no publication in English for many years. This seems to have meant their translations aren’t of the same quality as the other stories in the series. Still, I can’t help but love the first story and would give that a full 5 out of 5. Tintin in the Land of the Soviets is dragged down by Congo, which would have been more enjoyable without the racism. However, it would seem massively wrong to the creator if others had edited it, toned down the exotic hunting and racism. 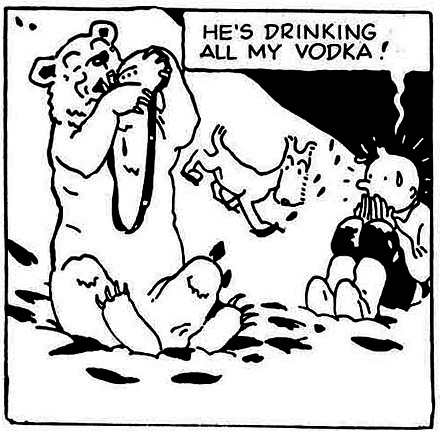 It would be a different story from the one Hergé wrote. Tintin only gets better from here onwards. Personally I would say you cannot start anywhere but the beginning. Overall average 4 out of 5. Well worth a read. Not entirely essential – and totally omitted in many reprint series – although the 3rd story Tintin in America does follow on from Tintin in the Congo. This is where it began. It’s best to start here. You may also be interested in Asterix the Gaul. As unfortunate as it is, it certainly seems like the image Herge uses was “comic shorthand” for black people during that era of cartooning. Eisner uses similar caricatures through his run of the Spirit, though his characters definitely had more depth than Hergé’s (and editor’s) unfortunate victims of Belgian colonial thought. Sorry about the lack of high quality scans for the second one. I can’t afford to get a copy right now, but hopefully in the future I’ll fix the images to match this books actual presentation. The images all seem to fine Ian, although I am likely to be less picky than yourself on their quality. The only difference appears to be that the French version has the sound effect “BUM” rather than “CRASH”. It is a shame about the racism in the book; the first story s full of comments on Russian life that make you feel he isn’t an ignorant man like the second story does. But on looking at his reported source material for Soviet Russia it turns out he was just being ignorant there too, even if it turned out he was mostly right. I’m not sure where I heard it, but I once learned that he wasn’t really a well traveled man. Apparently he just did a lot more research for his latter books. He definitely gets much better as it goes on. 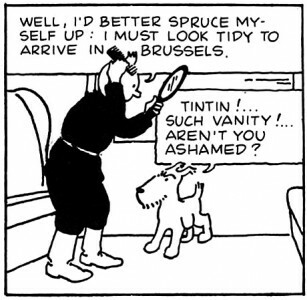 My father has many of the Tintin comics (which are called here “Tim und Struppi”, Struppi being the dog), so I looked at the pictures when I was very young, and also read them when I was a little older – but despite which age, I loved them. That’s all I have to say…no, there’s one thing. Tintin i nthe Land of the Soviets? I’m curious, why have I never heard of that? Probably just because it was never recolored and released in most languages. I love that it seems in every language Snowy has a different name; Snowy, Milou and Struppi so far. I am sure there must be more and I am very interested in finding out what they are. hahah, Rom-Rom. I wonder why the dog was female? Wouldn’t that be the only main female character in Tintin, then? I swear, I don’t remember many girls. Milou was named after the writers girlfriend, so was thought to be female until he was called a “good boy” in one strip. There is only one female character I can think of that appears often, Bianca; but she plays an annoying character, so you’d be right in saying there is no main female character that comes off favourably. yeah, I think I’ve heard that before. Not that it’s really that bad. It’s not outright misogynistic, just the kind of Boys Adventure literature that was popular across many media in that era. I’m catching up since I’ve been MIA since December. Hey Simon, sorry for the late reply so not sure you’ll see this but I’ll give you a rundown on each. Lucky Luke is basically the final of the Triumvirat in France with Tintin and Asterix. It’s set in the Far West and he’s a quick draw Gunslinger who always squares off with the 4 Dalton brothers. Spirou et Fantasio is sort of a buddy mystery comic. a very good time overall. Johan et Pirlouit is the off shot of the Smurfs and it’s basically a fantasy setting. Two guys live in the forest, they know a wizard. It’s very Arthurian in feel. Many thanks any educational web site. Where by different may perhaps I receive of which style of information coded in a real ideal way? I own a undertaking that I’m simply currently working on, i have been at the be aware of similarly info.